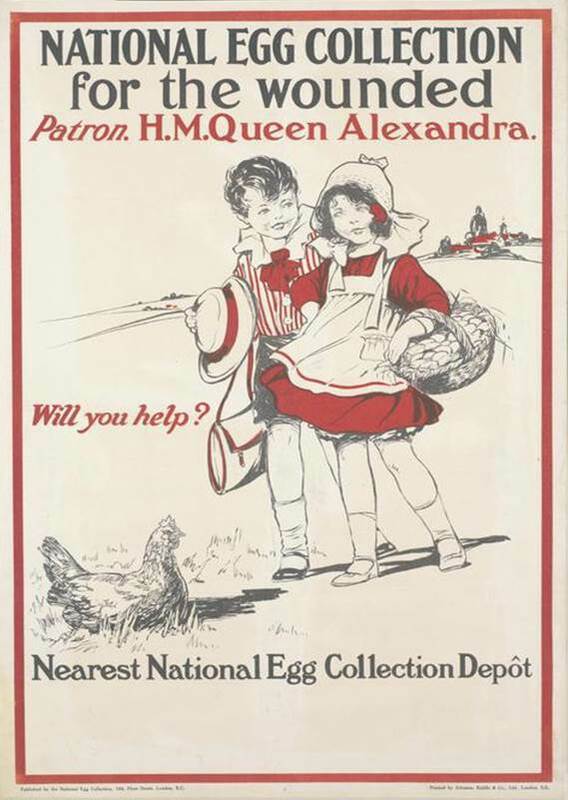 The National Egg Collection was launched in November 1914 following proposals put forward by Frederick Carl, the editor of Poultry World (a magazine for farmers that is still online published!). The aim initially was to provide 20.000 eggs a week to the wounded British soldiers in hospital in Boulogne, improving their diet and helping them to recover. However, very soon the organisation became so popular that... 1.030.380 eggs were received during the week 16-23 August 1915, not including those sent directly to local hospitals!. Special boxes and labels were supplied and free transport was provided by the railways. A central collection point was established in London in a warehouse provided by Harrods. Postcards were specially produced for children: ‘Ma! Teach me how to lay an Egg – I want to do my bit for the wounded!’ The famous graphic artist, Donald McGill, produced a card aimed at a more mature audience. Even more! 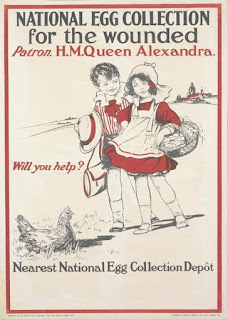 Female donors were encouraged to write their name and address on the eggs with a message for the wounded (Poultry World called them ‘eggograms’); many of them received back letters from the soldiers, expressing their gratitude for the gift. Eg. : Florence Hole (from Holwell, Dorset) received dozens of letters back and nowadays there is an online community which purpose is to attempt to locate those that responded.